Interactive matrix in a web report - Fast Reports Inc.
Now you can adjust the size of rows and columns. Drag the Photo field at the column header. 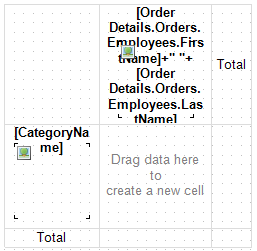 Adjust the cell size to fit both the added field. 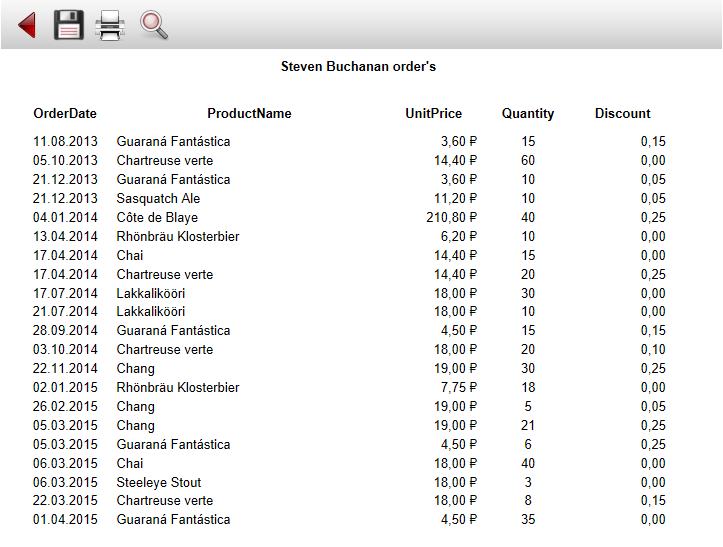 Now find connected Products table in the Order Detail table. Open it. It has also a connected Table Categories. 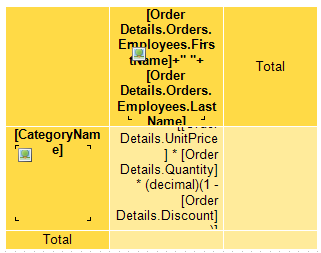 Drag the CategoryName field at the row header from the Categories table. Put the field Picture into the same cell. 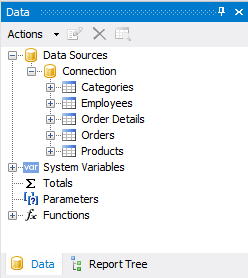 Create a detailed report on a separate page. Add a second page in the report. Add Field Order Details.OrderDate on the data band. Place the field Order Detail.Products.ProductName beside him. Also, we drag the field: Order Detail.UnitPrice, Order Detail.Quantity, Order Detail.Discount. Here we compare the first name + last name of employee with the parameter, and the category name with the parameter. Select the second page and the parameter Parameters. The values of sub-parameters will be inserted automatically. The report is ready. Save it. Now create a Web application. I'm using ASP.Net MVC project. Add a reference to libraries FastReport.dll FastReport.Web.dll. HomeController.cs find the file in the Controllers folder. This controller of start page. Here we will work with the report object. WebReport webReport = new WebReport(); //create the instance of the WebReport. There are two options of interest: TabPosition and ShowBackButton. The first is responsible for the display of the tabs in the toolbar reports. We hid the tabs. The second option sets a button «Back». It allows you to go back to the previous report. Now display the report in the view. Open the file for editing index.cshtml (Views- folder> Home). 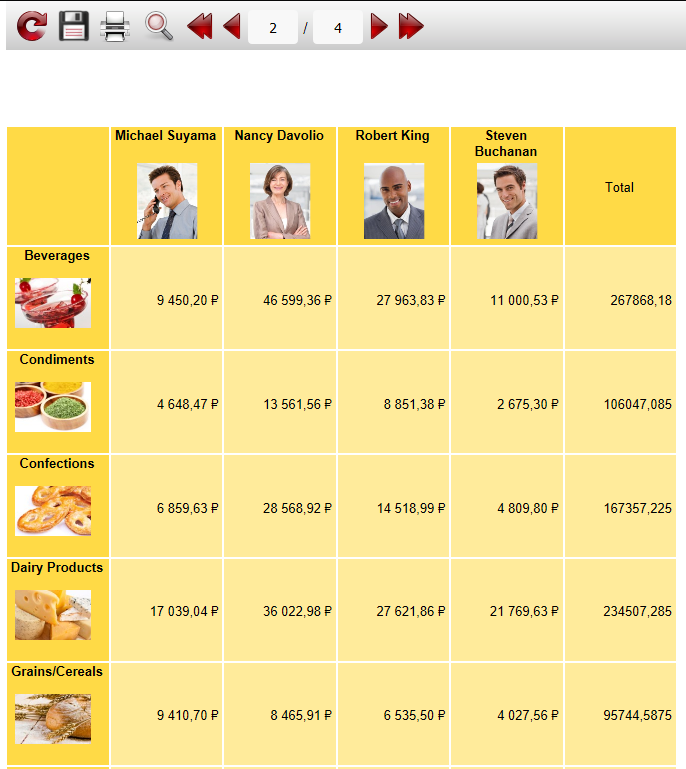 In a detailed report shows all orders placed this employee by goods from the selected category. Now we know how to create an interactive template for the Web. One more type of report to the our piggy bank.